Bluetooth Barcode ScannersBluetooth barcode scanners connect to your tablet or phone via Bluetooth pairing for portability and uncluttered counter tops. KitsBuy pre-configured and guaranteed compatibility point of sale kits from StoreKit. BluetoothBluetooth barcode scanners connect to your tablet or phone via Bluetooth pairing for portability and uncluttered counter tops. Financing and volume pricing available. Create an account to get your StoreKit discounts. Securely mount an iPad Air or iPad Pro 9.7-inch on any wall – with style and elegance. You can quickly and securely install the WindFall Wall Mount with only two screw holes and one additional hole for the ethernet cable. 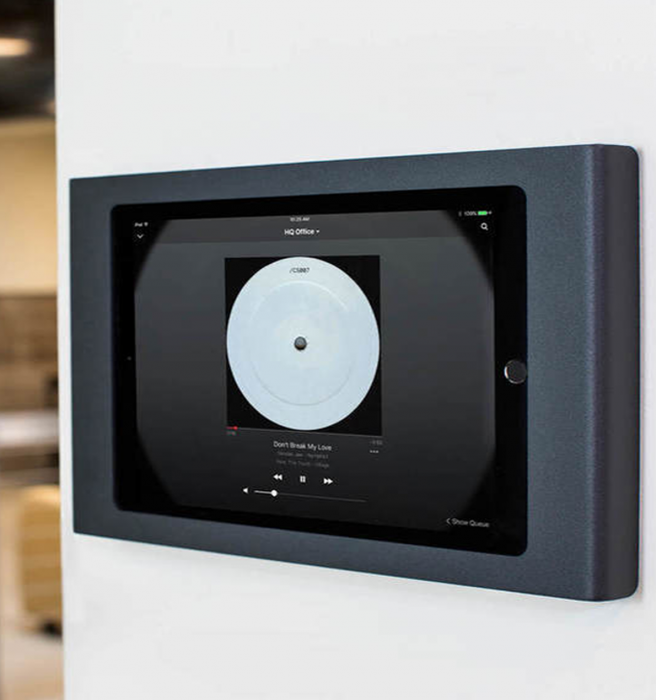 Suitable for all kinds of settings the WindFall Wall Mount is thoughtfully designed to maintain a constant flow of air over the entire rear surface of your iPad. As your device screen will likely be on non-stop, it’s critical to protect against overheating. Display your iPad in style with the Heckler Design Windfall stand for iPad Pro 10.5″. Laser-cut from a single piece of steel, the Windfall is a secure, slim stand perfect for any counter-top. Built with security in mind, the Windfall features a built-in Kensington security slot and the optional pivot tack accessory for extra security. 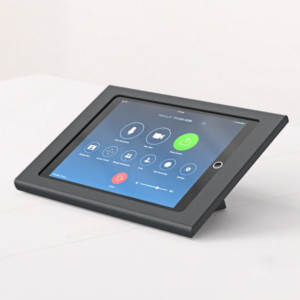 Designed in collaboration with the Zoom team specifically to control Zoom Rooms, this striking hardware enables you to use iPad – the best device for Zoom Rooms control – without compromise. Sleek looks, commercial-grade construction, beautiful finish and theft resistance. 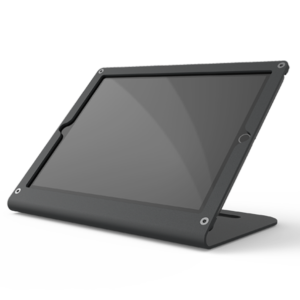 The Dual Tablet stand is a universal 14″ (35cm) tall countertop stand designed to elevate the point-of-sale experience. Fully angle adjustable, and customisable with the optional addition of a second tablet mounted to the rear of the stand. The Dual Tablet stand includes a super strong adhesive base plate to enable damage free, permanent installation onto any counter surface. The included Universal Connect Adapter adheres directly onto your tablet, enabling it to mount onto the Dual Tablet stand with an intuitive ‘rotate and click’ motion. 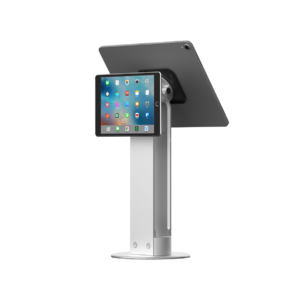 The Flex Stand is a beautiful iPad stand designed for retail and hospitality environments. 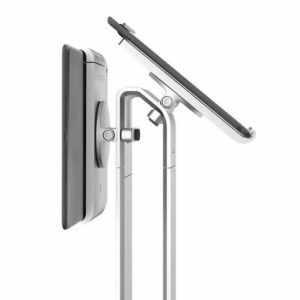 The Flex elevates the iPad, offers angle and height adjustment, whilst managing cable neatly within the anodised Aluminium frame. With a dual iPad mount option, the Flex stand provides complete flexibility to be the ultimate stand for every environment. Excellent company to work with from start to finish, very patient and knowledgeable. Pointed me in the right direction but allowed me to make my own choices on the information they gave. Brilliant sales team - great knowledge of their product range & compatibility, helpful and efficient service with next day delivery. Storekit were very knowledgeable and very helpful, they helped me make a decision with confidence. Thank you. Ordered till, printer and iPad stand. All arrived promptly and well packaged. All items working as expected. StoreKit Ltd (company registration number 10484598) is authorised by the Financial Conduct Authority under registration number 767079.